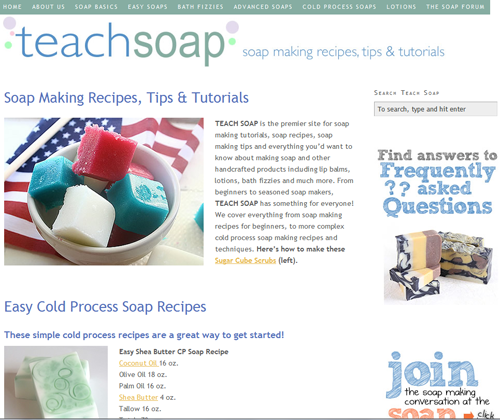 If you’ve visited TeachSoap.com recently, you’ll notice it looks a little different. If you haven’t seen it in a while, you should go check it out! We’ve completely re-organized our projects, and given the website a fresh new look. We’ve reorganized the categories to make everything a bit easier to find, so all our projects are under neat little headings. We’ve also added a few projects, so you might find something new. To get to the tutorials, just hover over the category you want, like “Cold Process Soaps”, and select a project from the drop-down menu that appears. If you’re just looking for general information, click on the heading itself for an introduction to the topic you’ve selected. Teach Soap projects are also now searchable (a suggestion whose time has come). Looking for a project that has Jojoba oil in it? 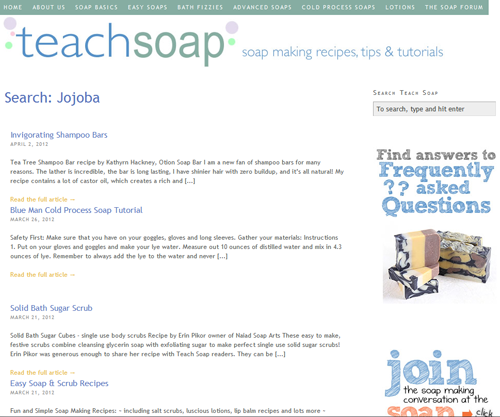 Just type “jojoba” into the search bar on the right-hand side of the site and hit enter. It’s easy to find any project you’re looking for. We’ve also updated the FAQ section to answer the most common soapmaking questions we’ve gotten over the years. Just click on the picture of our gorgeous tamanu oil man soap to go to a list of frequently asked questions. To see the answer to the question, just click “show the answer” and be enlightened! Of course, you can still always access the forum right from here if you don’t find the answer you’re looking for. The link is in the upper right-hand corner of the site no matter what page you’re on. Or, you can always find it through Teachsoap.com/Forum Let us know what you think about the redesign. We’d love to have your input on how we can make it even better! I love the forums as well, they are so easy to navigate and find information. But I think the new look to Teach Soap makes it look new and super stylish. Love TeachSoap! The new design looks great. Thanks so much for the quick guide on finding our way around the new site. Love it! Also, do you know how much time I can spend there? It’s a wonderful, informative and fun site. I’m so glad you like it, I also love the new TeachSoap! The new design makes it super easy to find what you are looking for and there is an incredible wealth of information to be found. The website makeover looks fantastic, Anne-Marie! I like the clean look, and the category tabs are very handy. The search function is also a great idea. I’ve been a member of the Teach Soap forum for almost three years now, and it has been such a terrific resource and a wonderful place to meet new friends. Many thanks to you and Team Bramble Berry for all of your hard work! I love the new look! It is definitely easier to find things now. Great job…Thanks so much! they have given me great ideas, and helped solve problems. I love to hear people speak of all the good things about America, and how much they enjoy it. I’m from Taiwan and have been here for 17 years. There are a lot of handmade soap makers in Taiwan. Although Taiwan is a very tiny island, there are a bunch of professionals & amateur creating beautiful soaps. Some of their soaps were reviewed by Cocobong or been included in the book “The Art of Soap”. But if you’ll search the web, almost all the “teaching/tutorial” things are created here in the States, I do not know much about Europe or the other countries, but I learn my AutoCad (computer CAD drawing), soap making, sprouting, even how to mate my Maltese & deliver the litter at home, all from the internet(American). Fantastic! I hang out there a lot and love the new look!!! I love the new and sleek look, it makes it look super fabulous. Wow, I had never heard of this website. So thank you, thank you!! !